Appleton, Wisconsin. I spent the last three days as a visiting artist at Lawrence University. My old pal Ben Rinehart invited me as part of their lecture series program. Ben and his partner Josh moved her two years ago leaving NYC for a full-time teaching job which in a matter of days snowballed into the American dream of home ownership and fatherhood. Once Ben signed his contract he and Josh found a wonderful house just 1.5 miles from campus with a sweet yard and lots of space, something one only dreams about in NYC unless they have the cool 1.2 million, the average price of a one-bedroom apartment. And just as they were getting moved into their new home a wonderful new opportunity came upon them to adopt a beautiful son, who they named Harper. So this weekend was my first trip to Wisconsin, the first time seeing their new family and visiting the house. It was one of the most wonderful weekends I have had in recent memory. The weekend began with a full schedule of a group critique of art students at Lawrence, followed by lunch with faculty, individual critiques with students in the afternoon, a public lecture, gallery reception, then dinner. It was intense, compact and extremely rewarding. The caliber of students at Lawrence is extremely high. The students are some of the most thoughtful and well-researched kids I have ever met. During our critiques they would tell me who they have read, what artists they are looking at and all the additional research they do from the point of view of art, biology, sociology, economics, etc. They are smart, they know that art does not happen in a vacuum and they conduct through their library, in book, film, and visual documentation. They are able to explain what the goal is of their work and they achieve. Many of these kids are double or triple majoring and have three, four and sometimes five minors. They are high achievers. The exhibition of my work supported the lecture that I gave about my running, hiking, and making art. Sometimes when I give talks there are things in my brain that I think I communicate but I actually don’t’. I showed a lot of photos, perhaps too many but I did it in rapid succession to illustration the collection of images I made for my future work. The next day after the best sleep I have had all year, I got up to run. The weather was perfect, 41 degrees, dry and mild sun. It was to be a slow, muscle relaxing 8 miles. I started out trotting along the sidewalk, running along the river, and over each of the bridges in Appleton. I did not keep track of my time, and I had not even broken a sweat when I check my watch. I had already covered 6 miles at a 7:39 pace, which is faster than the last 10k I raced. I was thrilled and it was a big boost to my confidence since the NYC marathon was just one week away. I went back to the house and did 30 minutes of yoga. Later in the day after Joshua, Ben and Harper returned from the neighbors birthday party we loaded up the car and headed to the outlet mall, an extravaganza of North Face, Gap, Ralph Lauren, Eddie Bauer and a whole slew of other stores. I scored big time, coming back with two new pairs of pants, four sweaters, flannel shirt (I was in the Midwest after all I need a some flannel), and three long sleep black t-shirts, all for $150. That alone was worth the flights. That night we went to dinner. Eating in Wisconsin feels like a foreign country, it is very odd that everything contains milk and meat products. The day before at the university lunchroom I saw adults drinking glasses of milk, I did not know anybody over the age of 10 drank glasses of milk. Anyhow we went to a Mexican restaurant, which is always a good bet, being that two of us are vegetarian. One can always get beans and rice, ahhhh, with exception of here. I did not even think to ask if the beans were prepared with lard and sure enough they are cooked with ham. No big deal just take the beans out of the burrito and use roasted vegetables and rice, that is unless the rice is made with chicken broth – grossssss. So that removed the rice as well. But the dinner did come with a salad bar and I was excited to get some greens. At first I saw a big bowl of iceberg lettuce and thought, oh god this cannot be happening, but right behind the iceberg was a nice bowl of deeply colored mixed greens. As I started to pile on the broccoli, I saw cheese shreds in the broccoli, why in the world add cheese to broccoli, but unfortunately it did not stop there, it also had some kind of meat product, ham or bacon mixed in with it. There was no vinegar and oil dressing only creamy milk based junk. It was all meat, all the time. I could not help but think about my recent studies in clinical exercise physiology and diabetes. I am sure the rate is high here as it was pretty obvious the obesity rate was. I had to tease Ben, who really likes pork, but he is very slim, that he could get chicken gravy or pork gravy on poured over his meal. Umm yea, give me a pork and cheese enchilada smothered in pork gravy. Other meals we had over the weekend were very tasty. I had a delicious tofu bulgogi at a very popular Korean restaurant and a nice vegetable and angle hair pasta with lots of artichokes, olives and sun dried tomatoes. I did however ask to have it prepared with olive oil rather than butter. The thought of butter made me visualize a bowl of melted butter with pasta floating in it all runny and soggy. That was probably not the case at this rather expensive restaurant but I was not about to take any chances and since I am not a dairy eater, I was not going get sick. Yes I am a troublesome dinner outside of NYC but if my eating habits can keep me running strong, ward off arthritis, osteoporosis, obesity, diabetes, and possibly cancer I will do anything I can to keep healthy. Plus I see no reason for eating animals. I spent Thursday though a very early Sunday morning in Wisconsin. It was tremendously relaxing and I had the best sleep I have had all year and the best run. The noise and the light of my apartment in NYC, while I am deeply conditioned to it, have an affect on how well I sleep. The getting up at 6:30 to take the dog to the park always feels a bit tiring, yet I easily awoke well rested at 5:00 today to catch my plane. I am excited to get home, but I miss Ben and it was great to see him. Being at Lawrence really makes me examine my the University where I teach, comparing the students, the administration support, the budgets, the enthusiasm and involvement of other faculty, the ultimate university community where everything is about investigation, ambition, involvement and excelling. It was an inspiring environment and far less stressful than being at a tuition driven university with little administrative support and with students who need more recourses than the university can offer or perhaps should offer for people that are expected to operate at a standard university level. It gives me a lot to think about. Now I am on the plane from Chicago to New York. When I get back my dog will be eagerly awaiting me and Kat, a friend and trainer of Conrad may be at my apartment with her two dogs who stayed there while I was away. I have a paper to work on for exercise physiology, and a few miles to run to keep my legs going. Whatever I am working on, I have the NYC marathon in the back of my head with high hopes for cool and dry weather. I have been corresponding this last week with two new friends, both of which qualified for the Boston Marathon and New York Marathon. It is a little secret that you do not have to wait in line with the lottery system for the NYC Marathon but rather you can qualify by time in either a 1/2 marathon or a full marathon. I will post those tomorrow and long with a number of other tips on cost efficient ways to getting to Boston or New York. One reason I am in a big hurry is that I have to get to my studio before I go to the University. I have an exhibition in Appleton Wisconsin at Lawrence University this weekend. I am exited to get in the fresh air and see my long time pal Ben Rinehart who is a new Professor there. Lastly on the update, I am finally getting over a hideous cold I have had since running Chicago, and I ran 6 miles at pace yesterday and did some strength training. I am gearing myself up to do it again, in NYC on November 2. The nice cool weather will help me reach my goal much better than the 85 degrees in Chicago. All this running makes me want to get back in the studio to work on some new pieces, but before I do that I need to make room! 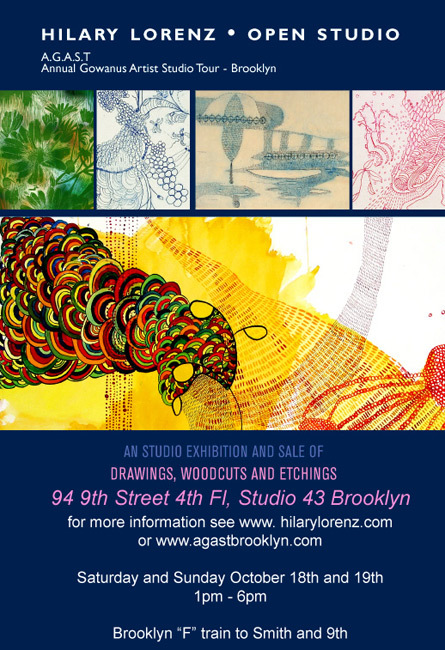 And just my luck this weekend, October 18th and 19th is the Annual Gowanus Artists Studio Tours. Over 150 artists in 28 building open their doors to show and sell their work. From 1pm – 6pm or later I will be at my studio, 94 9th Street 4th Floor number 43 just waiting for visitors to come. I recently got my exhibition back from Pfizer, Inc. 28 framed works that, well, frankly need to find homes so that I have more room to create some new work. So please come by just to say hello or if you are interested in coming to my studio but can’t do it this weekend, just send me an email and I can schedule you a private visit. 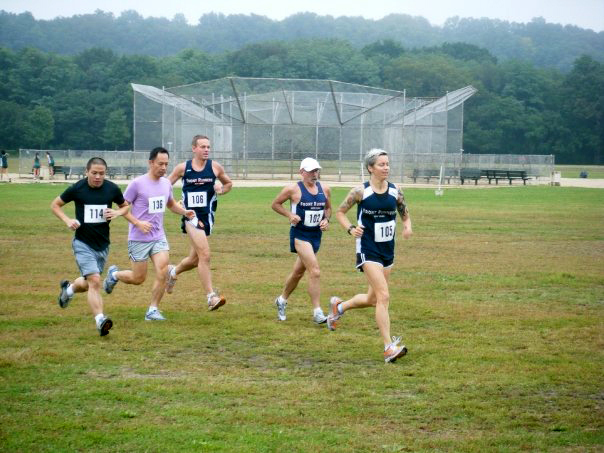 October 12, 1930, 86º was the record high temperature for Chicago, October 12, 2008 the temperature was 85º and I was attempting something called running. That is what it felt like. 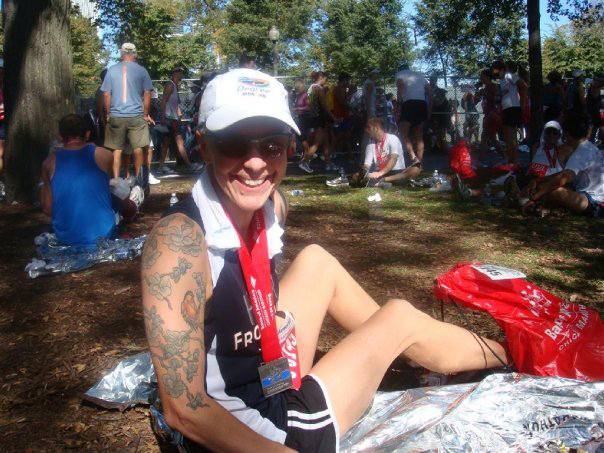 When I signed up for the Chicago Marathon with 10 of my Front Runner Teammates, I thought there is no way the terrible conditions of 2007 can be repeated – well maybe not quite as bad but it was bad. My goal 3:45, conservative, I ran my first marathon last year a 3:49 in NYC on a harder course, plus now I am stronger and fitter. I thought maybe I could even do closer to 3:40. I decided to run with a pace team, the pace being 8:35. At the start the temperature was 64º and we immediately entered a tunnel which was about 10 degrees hotter and it was hard to breath. The pacers went out way too fast, the first mile was 8:01, the second 8:15 and at the 10K mark we had 1 minute 20 seconds in the bank, not a good idea. I decided to back off from them at about the same time two women joined me and we decided to run together all with similar goals. I started to feel like this is a little too tough so early in the marathon, I passed the 9 mile mark, rounded a curve and just before the 10 mile mark I saw the bank clock, 85º. Oh, God, and it is less than 1.5 hours into the marathon. This scared me a bit and maybe psychologically pulled me down, but I kept thinking 3:45, 3:45. At the 1/2 marathon mark I came across a cluster of very fit, very thin tall 20-30 year men with 3:10 pace on their shirts, all walking, there were 3:20’s, 3:30’s, 3:40’s and 3:45’s and even some 3:00’s around me, all walking. There was a girl who passed out on the side of the road being fanned by strangers, a man vomiting on the other side of the street, another getting a cramped massaged out of his leg. At mile 14 I should have been at 2:08, but I was at 2:10. I thought maybe I could make 3:50, but before I knew it the 3:50 paces passed me up, with almost no one in their group. At mile 16 I wanted to cry or walk, I thought if I get to the water station I will walk through it as I drink my gatorade, I did. Then I ran water station to water station. At first I walked through the gatorade, then ran to the water and drink it. By mile 20 I walked through the gatorade, and the water, but mile 24 as I was looking for my family I thought I may not even make it under 4:00 hours so what is the use, I will stop and chat and maybe just leave to go eat pancakes, but I did not find them so I kept running. Just before mile 25 I wanted to walk so bad I thought, I will run faster to get to the water station, I ran a 8:15, oh good water. Then on to mile 26, my sisters came running out, I got my legs moving from a dismal 9:30 to a 9:00, then as I rounded the corner to the finish line, I checked my watch, 3:57, I had to get there before 4:00, I ran as fast as I possibly could. I did not look at my watch, believe me it was slow, but I just had to get across that line, I did 3:58. Oh what a horror, people down everywhere, people vomiting everywhere. I hear a wonderful familiar voice call my name, my teammates where laying in fetal position on their heat shields under a tree. Three were unaccounted for. One super strong runner had dropped out at mile 20 and was held at the medical tent for 2 hours, two others we were unaccounted for. It was a hard day. But unbeleivable three of my Front Runner teammates got PR’s. One Peter McGrane got his first sub 3:00, what a monster, also Mike Terry and FaTai got PR’s! Most of us where 10-20 minutes off our time, it sucked. I arrived in Chicago last night wearing my Boston Marathon jacket. I only recently bought it. After running Reach the Beach and seeing so many people, and being awed by them, in their Boston jackets I had to get my own. After all I qualified for and run the Boston Marathon in 2007, why didn’t I get my own jacket? I have to admit I felt really special wearing it, I met marathoners in the airport and on the L. People from the UK and from Mexico, man, I love running and I love runners. It sounds so simplistic to say, but what a bunch of nutty good people. Back to Chicago. I did an apartment swap with a really lovely couple. I am sitting at their kitchen table drinking my morning coffee, calling my friends who are up early and trying not to jump out of my skin or second-guess any of my choices. 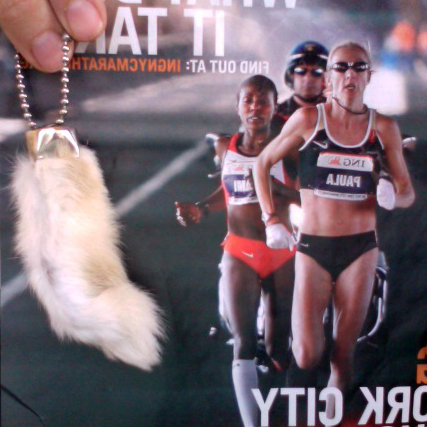 Sitting next to me is a photo of Paula Radcliffe and Gete Wami for my inspiration. The photo of them from the 2007 NYC marathon is so intense. Sitting on top of the photo is a really lucky rabbit’s foot given to me by my friend Tiffany. I have never run with a talisman but on Sunday I will have this little guy in my front pocket pulling my knees and feet closer and faster to the finish line. Just after noon I will go to the expo to pick up my number. I am meeting two teammates, Kieran and Fatai. I will also meet Tom Greene from the Runners Lounge. It is a site for runners to meet and share information and stories. Also I am going to pick up a “Stick” for the 21 day challenge. This thing is suppose to be a miracle for the legs and I am excited to try it out and report about it wonders. I am eating my morning steel cut oats. This is the best reason for doing an apt. swap vs. staying in a hotel. I can cook my own food and the one thing that is most important especially before my marathon is eating my favorite breakfast three hours before the race. None of that crappy instant stuff for me. I want the thirty minute cooking kind with a cup of black coffee and by race time I am ready to run. That’s it for today, I am going to pack up my rabbits foot, my photo of Paul and Wami, write down my finish goal time and stick them in my pocket, for good luck. This will be a short lived lead of me at the start of the Front Runners Cross Country meet. I did come in 2nd overall for the women which is very exciting.I also beat the two younger guys on the left, #114 and #136, but Michael, 106 and Dave 102 wiped me out. And while it looks like there are only 5 of us, there were 41 in total. So across the country? Yep, I am leaving in 2 days for Chicago. The Chicago marathon is on Sunday the 12th and I will be there on the 9th with plenty of time to rest and collect my thoughts of exactly how I am going to run the race. I have three goal times but the one I can share is 3:45. So focus all the energy and good luck to Sunday at 8:00 and if the winds are will me, I will be done by 11:45 perfect time for brunch.